For the first time, the Aircraft Owners and Pilots Association and the National Business Aviation Association teamed to hold events at the two national party conventions. The goal: Schmoozing politicos to hold high the flag of general aviation. I attended the first, at the Republican National Convention in Tampa on Tuesday, Aug. 28, to see if AOPA held to its long-time non-partisanship — and to see if anyone would show up! Boy did they. By 6 p.m., the place was packed. AOPA officials were thrilled with a turnout that included several members of Congress. AOPA members in Florida had also been invited to see their association in action. A pleasant (and valuable) surprise was the strong participation of AOPA members from other states who were, in fact, convention delegates. Event sponsors thought they had made their mark. The package was complete with a full-page, back-page color ad in the convention’s daily newspaper published by The Hill, Washington’s influential insider “read” for Congressional staffs and lobbyists, and a co-sponsor of the events. Depicting a PC-12 turboprop single bounding over The Rockies, the ad read “Together, We Protect Your Freedom to Fly” – perhaps a subtle jibe at how much lawmakers and candidates use GA. The message included thanks to “friends of General Aviation” who as “public officials, Republicans and Democrats, have promoted and protected General Aviation as a critically important sector of our National Transportation System.” Cited were 240 members of the Senate and House and 40 state governors. AOPA President Craig Fuller referred to this GA Caucus recruited by the Washington alphabet groups as “far larger and more successful than we dreamed.” Clearly, AOPA was pleased this night. A special display at the event listed supportive officials on a GA Honor Roll by name and title. The 4 p.m.-11 p.m. soiree would last through the final keynote address at the Convention, held just down the street. While the cocktail hour crowd was the largest and filled the waterfront Taverna Opa restaurant, new arrivals continued for hours. Big-screen TVs beamed in action from the convention hall. The Channelside complex outside was jumping with convention crowds. Other restaurants were hosting private parties for other groups or causes. And in the center of it all was the MSNBC outdoor TV studio where Chris Mathews, host of “Hardball,” held forth with a parade of newsworthy Republicans. One of the biggest newsmakers that day was former Florida Republican governor Charlie Crist. He had just endorsed the Democratic ticket even as Republicans gathered in Florida to nominate the opposing candidates. 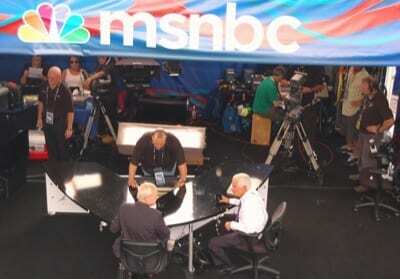 MSNBC’s Chris Mathews chats with renegade Florida Republican ex-governor Charlie Crist during a commercial break. I couldn’t hang around AOPA’s party to watch that much-anticipated keynote speech by the new “take-no-prisoners” chief executive of my old home state, New Jersey Governor Chris Christie. But I was satisfied that AOPA and NBAA had spent their members’ money productively. AOPA’s Fuller had originated the plan to invest in a presence at the conventions; AOPA VP-Airports and State Advocacy Greg Pecoraro came up with taking over a nearby restaurant for convention-watching and schmoozing. Much to my surprise, the event was easily accessible (with a little advance research on the Web) despite being just outside the extensive convention security zone with all those closed streets. Has AOPA held to its non-partisan principles in hosting these events? After all, today’s strident political partisanship would be “third rail” for an organization representing all who fly. And while AOPA highlights certain candidates before elections, they are so endorsed only as strong supporters of GA. May it always be so. I’d say they passed the test this time, although I missed the brief welcome speeches. I had watched for any sign of partisanship, remembering the one time I know AOPA “crossed the line” by hiring a popular Clinton impersonator in the 1990s as the comedy entertainment for an AOPA EXPO closing banquet. While I have no doubt that most AOPA members lean Republican, I was pained to see 20 or 30 angry diners stand up and walk out. It was a mistake, it was opposed by some key EXPO staff, and it has not been repeated as far as I know. I assume AOPA members in North Carolina were emailed the same invitation (limited space, advance RSVP required) as Floridians to see all this tried again at the Democratic National Convention, which kicks off Tuesday, Sept. 4, in Charlotte. While watching lobbying in action, I hope they also get to enjoy Redbird’s new Piper Cub simulator that was a hit in Tampa. Big news at Oshkosh this year, the yellow “box” — complete with balloon tires and Cub hubcaps — was there to offer visiting politicos a taste of one of GA’s best-loved flying experiences — the better to understand us.